Wil Wheaton and I got excited and made a thing! 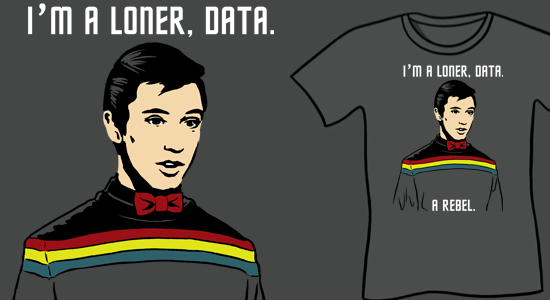 Check out our Wesley’s Big Adventure Shirt over at Sharksplode. There also aren’t any bathrooms. Last night Wil tweeted a bit about watching Pee Wee’s Big Adventure. It reminded me a line in his book, Memories of The Future, where he compared a particularly indignant and slightly snotty Wesley line read to the way Pee Wee informed Dottie that they would NOT, in fact, be knocking platform bar-dancing boots in the back of the bike shop. I found myself sitting at my desk, trying to convince myself to draw a comic about shotgunning the whole first season of Game of Thrones in less than 36 hours (a thing which I really did), INSTEAD of drawing the weird thing you see above. It seems that I lost my internal battle of wills, logic was thrown to the wind and common sense did not prevail. If you are now or were ever a fan of Star Trek: TNG, I can’t recommend Memories of The Future more highly. I have enjoyed reliving the first half of the first season of TNG through Wil’s eyes (both the ones he had as a naive child in an adult’s world, and those he has now, which look back at the series with fond reflection, a little regret, and a ton of snark) more than I would have thought possible. HEY A THING! : Someone familiar pops up in this Weregeek comic. ANOTHER THING! : My friend Tom Brislin has started a Kickstarter to raise money to record his first solo album. Fans of the HE Podcast will know his music from… the HE Podcast. Tom is a fantastic song writer, a virtuoso piano player and one of my favorite creative people on the planet. Please back his project so that I may hear the wonderful musics that are currently stuck in his brain. Posted in Uncategorized and tagged movies, Pee Wee's Big Adventure, scifi, star trek, tv, wesley crusher, wil wheaton. I agree, "Memories of the Future" is awesome and I hope he continues it at some point. Be sure and tell 'em … Lwaxana sent ya! HA HA HA HA HA HA HAAA! Man, I loved that movie when I was a kid, so I instantly read the line in Pee Wee's voice.. and then giggled at work, making my cubicle neighbors uncomfortable. It was a good way to start the day :). (With deep voice, into communicator): Paging Mr Riker… Mr Riker… you have a telephone call at the front desk! Picard: "Someone stole my shuttlecraft!" Another recommendation for "Memories of the Future"! Sorry if I sound like back-cover blurb, but Wil's unique position as an actor on and a fan of the show make it a really worthwhile read. I believe Volume Two is on the way because he read an excerpt from 10100010001111000101010101010111! !0100000101010111:-) at this year's Phoenix Comicon. I was 28 when Trek Original Series trail-blazed mass SF success. TNG was leavened by the Wesley character. Wil's blog is a regular visit for me. I admire the man, and his world. 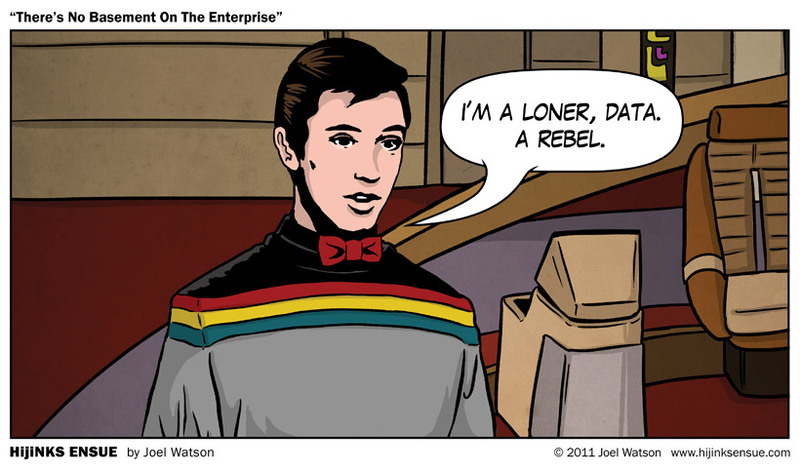 (Sadly, I do not make Geek, myself, but I love the Loner/Rebel graphic! pleasepleasepleasepleasePLEASE make this a shirt! Reading this right now brings an end to my three or four month journey through your archived comic list. I thought that I was a true geek, but now I realize that I'm going to have to go back and do a shitbox of research just to get halfway there. Congratulations on your continued experiment, and may it take you many years into the future! And thanks for all of the laughs! I'll be looking forward to checking in again often!